AIG/American General Guaranteed Issue Whole Life Insurance from American General Life Insurance Company (AGL) is designed to help provide secure, budget-based financial protection that you and your family can count on. AIG GIWL provides permanent protection with no medical exam for up to $25,000 in coverage, guaranteed. Rest assured, that if death occurs by accident, at any time, the full death benefit will be paid. If death occurs during the first two policy years and is not an accidental death, the benefit paid will be 110% of premiums paid to date. In the event of death after two years, the graded death benefit no longer applies and full death benefit is paid. Terminal & Chronic Illness rider inside their policy at very competitive rates. New Agents - Follow the steps: Click 2 page PDF. Wait 3-5 business days till you receive a writing number via email - If you have a GIWL that needs to sold today then Gerber Life can be used. User name and password to print out Gerber application can be retrieved in NAAIP back office. While Gerber life GI pays 60% - AIG usually has lower rates. See FEX Quoter at footer of this page on left side. Agents should always use the e-app when they can, it expedites processing. Paper applications can be used. AIG only makes the paper applications available to agents when they run a quote through their e-app which can only happen after you have a writing number. Agents should register with their agent ID to the GIWL portal: Guaranteed Issue Whole Life(GIWL) Registration and Sales input - Click here. Applications for new business are pre-populated with agent’s information so agent must be contracted first & login to pull and write applications. Once agent has a writing number, one can immediately go to the GIWL portal and register there to download an application kit if the AIG e-application cannot be used. AIG's E-apps allow you to use an over the phone e-mail signature method if you cannot meet your client in person. All AIG products can be Just-in-Time, with the exception of the GIWL. For JIT - Register and submit via NAAIP's iPipeline at the footer of this page. Talk to us and we will walk you through contracting through our SuranceBay eContracting system. 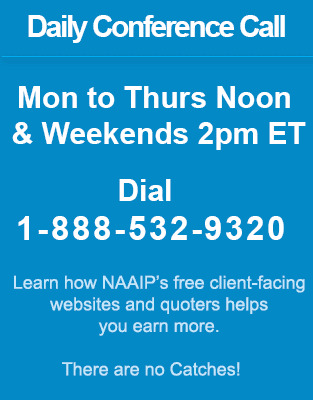 AIG Sales and Marketing Questions Call: (800)677-3311 - after you are contracted with AIG. * The information provided is intended for AIG licensed insurance agents only. It is not intended for the purpose of advertising the AIG insurance products to the general public. 03SPG.